The COEX InterContinental 's Asian restaurant, "Asian Live"
The COEX InterContinental Seoul's Asian restaurant, Asian Live announces the opening of an additional six private rooms suitable for accommodating from 4 to 10 guests. These private dining rooms are perfect for hosting all types groups from formal business clients to family gatherings with special flower decoration. In celebration of this event the hotel is offering a 50% discount (free for women's groups) on coffee service at lunch until the end of August. Our new private dining rooms are enclosed on all four sides by glass and softly lit creating an even more elegant atmosphere with a view of the Lobby below. The floors are finished with dark brown wood for a classy feel. 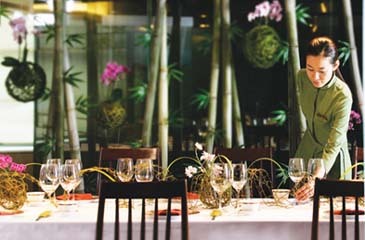 At Asian Live, now with 13 private dining rooms, enjoy your choice of either Japanese, Chinese, Korean or Indian food at one table. Our luncheon menus range in price from 26,000 won to 50,000 won. Dinner set menus run from 69,000 won to 250,000 won. (VAT and service charges are not included in these prices.) (02) 3430-8620.